New York City Department of Sanitation Commissioner Kathryn Garcia and her mother talk about food scrap recycling. Which comes first? A source of organic waste/feedstock, or organics processing capacity? The fear is that people will become discouraged and stop sorting their food scraps and yard waste from regular trash. The challenge is getting uncontaminated organics from school cafeterias where students have very little time to eat, let alone sort their leftovers. Organics represent 1/3 of our waste stream. Organics can be composted or used to generate natural gas. Why are we filling up landfills with organics? 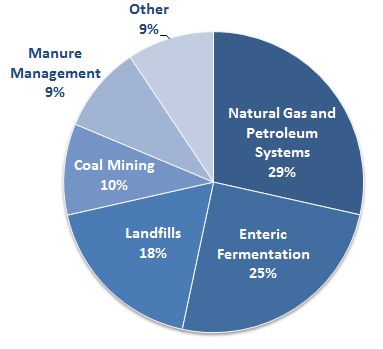 18% of methane emissions come from landfills. Methane is 21 times more effective at preventing infrared radiation from escaping our planet than CO2. New York Mayor, Mayor Bloomberg launches New York City's new recycling campaign at Morningside Gardens, a limited equity housing cooperative in West Harlem which is proving that organics separation in large building works. Composting is Recycling Down to Earth! Organic waste or "Garbage" is the oldest form of waste. Since it can decompose into rich soil it’s not bad stuff. Whether organic waste decomposes naturally in a compost pile, or in an anaerobic/biogas digester, it produces a soil amendment that is superior to synthetic fertilizers for growing trees, flowers, and vegetables. Kitchen Scraps like potato peels, egg shells, coffee grounds, and apple cores. Yard Waste, such as leaves, grass, and branches. Kitchen scraps and yard waste account for almost 22% of New York City's waste. Considering that it costs New York City tax payers about $300,000.000 per year to export waste to landfills in other communities, spending $67,500,000 of that on kitchen and yard waste seems like a lot. The EPA's Food Recovery Hierarchy recommends anaerobic digestion over landfill and incineration. The Department of Energy's considerable investment in Biomass technology provides a roadmap for converting post consumer organic waste into fuel. Bioenergy: America's Energy Future is a short documentary film showcasing examples of bioenergy innovations across the biomass supply chain and the United States. While these resources are primarily directed toward rural farmers, the requirements are basically the same for post consumer food waste. The key is having a "clean" feedstock.